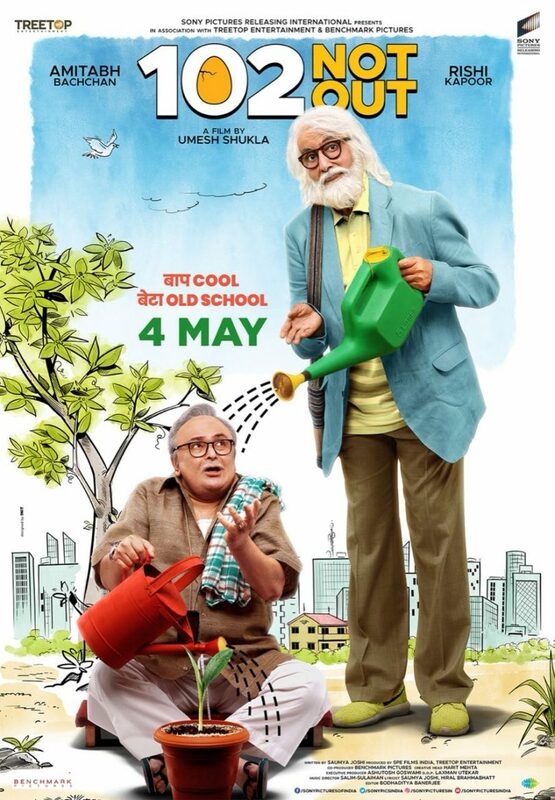 In a quirky yet symbolic new poster of ‘102 Not Out’, Amitabh Bachchan could be seen watering his son Rishi Kapoor. Most of the poster is animated except the two legends stand in it in a comedic way. Makers are distributing some very light hearted imagery of the film to tell the audience that this one is mostly the good time at the movies instead of an intense one. Teaser of the film portrayed both the spectrum of the story telling as it looked feel good but also saddened by certain realities of the society being depicted in it. Bachchan is watering Kapoor like a father does contribute to the growth of his child by providing all the essentials and in return the son does the same for next generation. Bachchan is playing a 102 year old man who is still very lively at the heart and rather notorious for his immensely ancient age. Kapoor plays the son, who himself is 75 year old now and was not shown with any extended family of his in the first look teaser. Kapoor is a more subtle one who might be scared of anything bad happening to his father for any reason. In an unlikely turn of events, Bachchan decides to send his son to an old age home which is the exact opposite of what happens in the world. This pot line makes the film a very interesting watch and must have been on stage as it is inspired from a Gujarati play exactly how Umesh Shukla’s directorial debut ‘Oh My God’ was also a part of Gujarati stage literature. Kapoor and Bachchan are both screen legends for over four decades now and have managed to pass the test of time unlike their colleagues. ‘102 Not Out’ will hit the dark of cinema screens on 4 May 2018.